One trend you will see this year is that showers are becoming more popular than tubs. Homeowners are looking to embellish the ‘shower experience’ rather than the tub experience- An increasingly popular feature is the curb-less shower. At NJW, your Columbus Ohio general contractors, we believe part of that trend could have something to do with many people aging in place (making your home adapt to your needs as you age). When a shower has a six inch curb it not only breaks up the flow of a room, it may also be a huge obstacle for someone that is wheelchair bound or has limited mobility. Not all bathrooms are a great fit for a curbless shower, but when we come out to do a bathroom remodel, it could be one of the options we explore based on your needs. A curbless shower is always a great touch to create a seamless sigh line. Two things to note, curbless showers have to be larger than a typical shower to contain the splash zone, and shower head placement is of the utmost importance when doing this type of bathroom renovation. 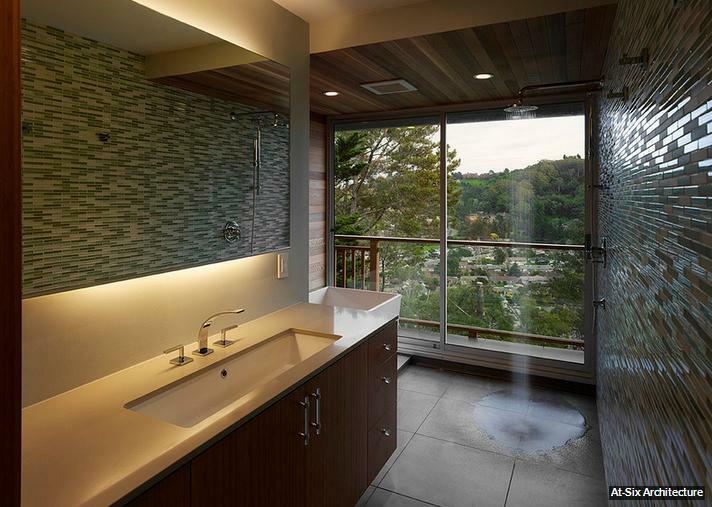 These showers can also be contained behind a frameless, glass enclosure if an open shower doesn’t fit your preference. The lack of a curb and a shower frame will allow continuous flow transitioning from bathroom to shower seamlessly. A smaller bathroom with an open, curbless shower requires that the entire floor be pitched toward the drain in the shower. Done properly, the bathroom will drain itself dry shortly after each use. Since it’s obvious this type of bathroom remodeling project requires a lot of planning and professional expertise, NJW can walk you through every aspect of your bathroom renovation. Contact us today to see how we can help you with your next home remodeling project! We currently build in, Upper Arlington, Powell, Pickerington, New Albany, Lancaster, Bexley, Gahanna, Westerville, Worthington, Whitehall, Dublin, Hilliard, Columbus and all of Central Ohio.